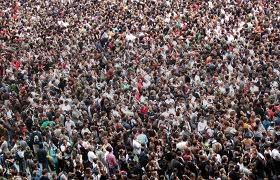 Personal Protection Tip: In general, there is safety among large numbers of people. For example, the city of Detroit currently has a population of about 700,000 residents which shields many people from being victims of violence. Make no mistake about: violent crime in our town is unacceptably high and several heinous crimes are going to be done every day. A specific individual's odds of being attacked is akin to winning the lottery - relatively low. However, if you have the misfortune of being selected for victimization, you run a very high risk of being robbed, raped, assaulted, home invaded, or murdered. Furthermore, you should strive to never travel alone in Detroit. In general, you are going to be safer if you have someone with you, especially when venturing out after dark. However, be mindful that having potential witnesses and protectors with you is not a guarantee that you will not be attacked. For example, just two days ago one predator with one handgun carjacked four women in a vehicle (one escaped) and drove the remaining three to a deserted location and sexually assaulted them.